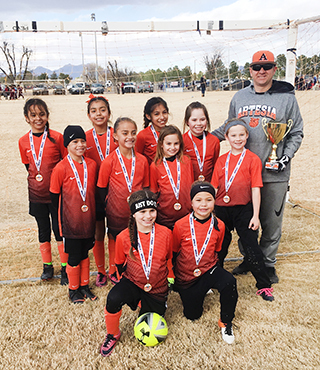 Artesia’s SUPERPRIDE girls’ U10 soccer team took first place Dec. 1-2 at the Las Cruces Chile Challenge. Pictured are, standing from left, Estrella Gutierrez, Kira Sentell, Maleyna Pando, Kaylee Berdoza, Marlene Corza, Olivia Bunt, Aubrey Partlow, Mallory Ebert, Coach Paul Lopez, kneeling from left, Zailee Valverde and Kazlyn Lopez. SUPERPRIDE would like to thank its sponsors.